1 of 3 Heat oven to 350 degrees F. Coat two 8-inch cake pans with nonstick cooking spray. Line bottoms with parchment or waxed paper; coat paper. Set aside. 2 of 3 Stir flour, baking powder and salt in medium-size bowl. Beat butter and sugar in large bowl until pale and fluffy, about 5 minutes, scraping down side with rubber spatula as needed. Beat in eggs, one at a time, until blended. Beat in coconut extract. Alternately stir in flour mixture and milk, beginning and ending with flour mixture, just until mixed. Stir in pecans and coconut. Pour batter into pans. 3 of 3 Bake at 350 degrees F for 30 to 35 minutes or until toothpick inserted in center comes out clean. Cool in pans on wire racks for 15 minutes. Turn cakes out; cool completely. 1 of 4 Stir the sugar and water in a small heavy-bottomed saucepan until dissolved. Simmer over medium-high heat until temperature reaches 240 degrees F on candy thermometer, about 10 minutes, just until it reaches soft-ball stage (a small drop of sugar mixture dropped into ice-cold water will form a limp, sticky ball that flattens when removed from water). Brush down sides of pan with a wet brush to avoid sugar crystals forming. Do not stir. 2 of 4 Place egg whites in large bowl of stand mixer fitted with the whip attachment. Beat for 30 seconds. Pour sugar syrup down side of bowl into beaten egg whites. Beat 5 minutes on medium-high speed. 3 of 4 Add coconut and vanilla extracts and salt. Beat on high speed for 2 to 3 minutes, until glossy peaks form. 4 of 4 To frost cake, dollop a bit of frosting on a platter to anchor cake. Place one layer on platter. Spread top with generous cup frosting. Top with second cake layer. Spread remaining frosting on top and sides of cake. 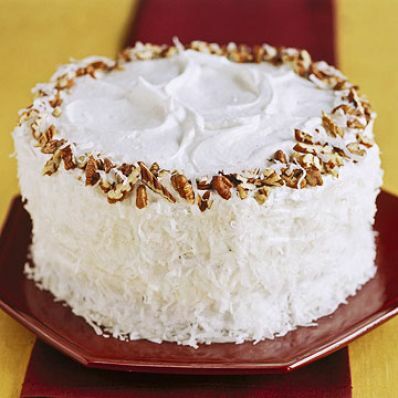 Garnish cake with coconut and pecans, if desired.